As commercial refrigeration experts, the Jersey HVAC Pros understand that any issues with your refrigeration systems are a top emergency for your business, putting your products and customers at risk. Any of our 5-Star Seal of Approval contractors will promptly respond to your call for service. What can you expect when you reach out to a contractor for industrial refrigeration repair? Our FAQ’s will help answer all your questions. 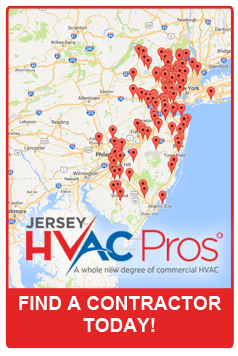 How do I reach one of the Jersey HVAC Pros 5-Star Seal of Approval contractors? Visit our Find A Contractor webpage and enter your zip code to locate a member near you. What can I expect when a member of the Jersey HVAC Pros comes to my business? The Pro will listen to your problem to ensure they understand all the issues you are having. Then, they will expertly diagnose the problem and offer solutions with accurate estimates. They will quickly and accurately repair the problem to get you back in business serving customers. Be assured our reliable Pros make your emergency their emergency, no matter when it happens. What does the 5-Star Seal of Approval mean? The 5-Star Seal of Approval is a standard for expertise, reliability, accountability, return on investment and trust that unites all members of Jersey HVAC Pros. As an exclusive statewide network, these professionals have trained rigorously to be superheroes who provide the same level of service for expert HVAC and industrial refrigeration repair and maintenance, no matter where you’re located in New Jersey. Can you tell me what kinds of commercial refrigeration equipment the Jersey HVAC Pros service? Our contractors can service commercial refrigerators, walk-ins, coolers, freezers, cold displays and ice machines in retail establishments, restaurants, medical facilities and other businesses that have industrial refrigeration needs. Contact one of our Pros for specifics about your equipment. I have a complicated system. What kind of technician will show up at my business, what training do they have? Great question! Our technicians are the best in New Jersey. Each one is licensed, bonded and insured with more than 9,000 hours of education during five years of classroom and hands-on training. Many invest in continuing education classes to expand their education. None of the Pros begin a project without receiving intensive training in the newest technology and practices in the industry, ongoing education and certification updates throughout their career. How can I prevent industrial refrigeration emergencies? A service contract with a 5-Star Seal of Approval member of the Jersey HVAC Pros is the best way to prevent emergencies. Regular maintenance of your commercial refrigerator should include cleaning and servicing of the condenser coils, fans and motors. During the visit, the expert technician inspects all gaskets and seals to ensure no energy is being wasted. They will also check for clogs that may potentially damage the motor and cause water leakage. Proper cleaning procedures are important to maintaining all refrigeration equipment for sanitation, cost control and prevention of breakdowns. These steps ensure you are getting the maximum return on investment. Find A Contractor near you today to experience the 5-Star Seal of Approval difference.